Metaplastic breast carcinoma (MBC) is a rare, heterogeneous breast cancer characterized by admixture of adenocarcinoma with metaplastic elements, low hormone receptor expression, and poor outcomes. 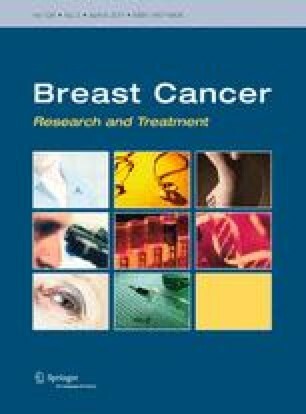 The authors retrospectively reviewed the medical records of 47 MBC patients and 1,346 invasive ductal carcinoma (IDC) patients. Two hundred eighteen of the IDC patients were triple-negative (TN-IDC) for estrogen receptor, progesterone receptor, and human epidermal growth factor receptor-2 (ER-/PR-/HER2-). Patients were surgically treated at the Samsung Medical Center between 2005 and 2009. The MBC patients presented with a larger tumor size, lower lymph node involvement, higher histological and nuclear grades, higher triple negativity (ER-/PR-/HER2-) and higher p53, CK5/6, and EGFR expressions compared with those of the IDC group. However, there were no significant differences in clinicopathological characteristics between MBC and TN-IDC. During the follow-up period (median duration of 30.3 months, range 2.6–56.3 months), seven (14.9%) MBC patients, and 98 (7.1%) IDC patients had disease recurrence. The three-year disease-free survival (DFS) rate was 78.1% in the MBC group and 91.1% in IDC group (P < 0.001). The three-year DFS rate was not significantly different between the MBC and TN-IDC groups (78.1 vs. 84.9%, P = 0.114). However, in patients with lymph node metastasis who underwent adjuvant chemotherapy, the three-year DFS rate was 44.4% in the MBC group and 72.5% in the TN-IDC group (P = 0.025). The authors found that MBC had a poorer clinical outcome than did IDC. In breast cancer patients with nodal metastasis, MBC had a poorer prognosis than did TN-IDC, despite adjuvant chemotherapy. This work was supported by a grant of the Korea Healthcare technology R&D Project, Ministry for Health & Welfare Affairs, Republic of Korea (NTX2101012).